Despite continued efforts of educational professionals to develop a quality, meaningful classroom experience for teachers and students, relevant to employability, there still exists in the USA a skills gap. This gap has created a lack of a competitive advantage in the national and global marketplace as well as a low return on investment. There is a growing consensus that highly developed education systems are unlikely to be capable of the kind of change which is urgently needed. Community-building in education is not just about creating or defining a new work for teachers to do collaboratively. It is about changing a school's professional culture. Establishing communities of practice (CoP) involves the whole educational experience. Engaging with learning has become a central focus for educators, administrators, business, and community leaders. This chapter attempts to bridge the gap between the either-ors by presenting a learning ecosystem and three case studies highlighting successful CoPs. A creative explosion of school formats will utilize diverse strategies and structures for organizing learning experiences to increase district adaptability and responsiveness (Saveri, 2013). John Dewy, in his book, Experiences and Education, speaks about the either-or philosophy of education. “Mankind …. is given to formulating its beliefs in terms of Either-Ors, between which it recognizes no intermediate possibilities. ´ (p. 17) Dewey goes onto say in his treatise, Traditional vs. Progressive Education, “The main purpose is to prepare the young for future responsibilities and for success in life” (Dewey, 1938, p.18). Dewey rejects an 'either subject-matter or learner' thinking that recognizes no transitional possibilities in between. Emphasizing the importance of both subject-matter and learner, and maintaining that educators need to direct student learning by integrating appropriate content into the learner's total experience (Tan, 2015). An example of this either-or conflict is the current tug of war which exists between state and national accountability standards which mandate immediate change, and on the other side, is the educators’ who want to build stronger teacher-student learning relationships in the classroom, which take a lengthier time to produce noticeable result. Inviting individuals to develop relationships and share their abilities to create and use knowledge at the school-wide level is easier to facilitate than in a classroom, where a greater focus is often placed on the individual’s ability to meet prescribed learning outcomes (Kane, 2016). However, over the past few decades there have been many improvements in curriculum, effective teaching and learning strategies and assessment procedures. What is now needed in most schools is an alignment of these practices (Cooper & Boyd, 1995). Community building in education is not just about creating or defining a new work for teachers to do collaboratively. It is about changing a school's professional culture (McLaughlin and Talbert, 2006). It is also about changing the culture of the classroom. By definition, a community is a group of people who work with one another building a sense of trust, care, and support (Hittie, 2000). Part of a teacher’s profession is to provide opportunities and structures by which students can support one another. To accomplish this goal of creating a sense of share community, teachers will provide explicit instruction and guidance so that students learn how to feel members of a common interest. Community building is something which requires active participation by all members to create. Through cultivating relationships, we learn how to create communities within our classrooms. “In our room, we call these dispositions and realizing them starts by elevating us all to the status of learner (Brown Wessling, 2012).” There's no doubt that the membership, the trust, the sense of self that comes from being part of a classroom community keeps kids in school and keeps them engaged (Jalongo, M. R., 1994; Cooper & Henderson, 1995; Senge, 1995; Hittie, 2000; Brown Wessling, 2012; Eng & McLean, 2014). Teachers all over the world are building a literature of practices promoting community building in the classroom (Hittie). Effective community building is also an essential element for cultivating what are essentially ‘communities of practice’. Establishing communities of practice involves the whole educational experience, requiring us to explore common goals and to investigate creating shared values, beliefs, and attitudes about learning. Unlike traditional notions of community, a community of practice is regenerative and can create structures to help institutions fully realize their potential when traditional or inadequate structures exist (Nair & Thomas, 2018). 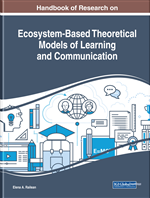 Learning Ecosystem Environment: The school community, where administrators, teachers, students, and other personnel interact with a common goal of learning. Stakeholder Network: Stakeholders include all those organizations, networks and private groups which partner with host personnel and are able to influence the objectives the organization. The internal stakeholders of education institutions include personnel and students, while the external stakeholders include community partners and businesses. The importance of external stakeholders increases when the public funding of higher education institutions decreases. Educational Ownership: Ownership is the amount of investment learners, teachers, and administrators have in the subjects and issues that are being learned in the classroom as well as within the school community as a whole. Ownership involves the methods used for learning and the places where learning happens. Partnership is a central component of educational ownership. John Dewey, in Democracy and Education , was an early proponent of educational ownership. Either-Or Philosophy of Education: An either/or philosophy, first noted by John Dewey, is one where education vacillates between “development from within” or “formation from without”. This philosophy denies the role individual learner social experiences play in the advancement of learning. Partnership must exist between teachers and students. Under-Represented: Those racial and ethnic populations that are underrepresented in any given educational program relative to their numbers in the general population. Digital Ecosystems: Ecosystems refer to the connections and processes that define how the various parts of the ecosystem work together to form a larger cohesive unit. Digital ecosystems use technology and the internet to link groups of people with the same goals and focus. Key components will include connected users, digital micro content, smart delivery system, analytics engine. Student Voice: Expressions of learners regarding and contributing to any aspect of education. Shared: Learning: The process of working cooperatively to accomplish a mutual objective. Shared learning promotes equality of opportunity; respect for identity, diversity, and community cohesion.